Sub-Saharan Africa has the lowest electrification rates of all developing regions, and its rural areas are the most poorly provisioned of all. To meet this specific challenge, EDF and its partners have developed Decentralised Services Companies (DSCs), commercial, profit-making companies governed by local law. A major factor behind their success is the training of local specialist personnel – something all stakeholders in this sector should encourage. Excluding China, the number of individuals without access to electricity has increased worldwide over the past fifteen years, reaching a total of 1.2 billion people (IEA, 2013) – and this trend is set to continue in the coming years. Indeed the current electrification deficit – a backlog that is already a major challenge to remedy – is set to grow automatically, driven by demographic growth, with the result that some 550 to 650 million more people will be without electricity in sub-Saharan Africa by 2030. While energy poverty primarily impacts the rural populations of South Asia and sub-Saharan Africa (the two regions together representing a population of around 600 million), the situation is particularly critical in sub-Saharan Africa. Despite its sizeable capacity of potential energy resources (hydropower and wind energy, oil, gas, coal) Africa’s total energy production capacity is no larger than that of France. Electrification rates (map 1) are among the lowest on the planet – with huge variations from region to region: 99% in North Africa, compared with 31% in sub-Saharan Africa. Alongside these regional disparities there is a significant dip in rural provision, where the variation in rates of electricity access is at its most extreme: 98 to 99% in the north, barely 12% in sub-Saharan Africa. Decentralised rural electrification, covering the areas that are often located furthest from all the electricity grids, is a crucial challenge for the continent’s development. The scale of the challenge posed by rural electrification in sub-Saharan Africa is now a matter of urgency, and all the more challenging given the dispersal of human settlements within the region. Moreover, the poverty of Africa’s rural populations and the low level of energy demand makes any electrification policy costly and relatively unprofitable in commercial terms. Add in the lack of basic infrastructures and it becomes clear why these projects demand such a high level of subsidy in developing countries. Policy-makers are therefore generally reluctant to embark on electrification programmes, all the more so because the governments involved simply cannot afford to fund them. Quite apart from the high financial risks and the lack of funding to cover them, there are numerous other obstacles, too: lack of access to credit, inadequate regulatory frameworks, the scarcity of local expertise. Because governments are unable to fund these programmes and the private sector cannot generate a profit from them, they are generally the preserve of operators for whom profit is not the main goal or the sole priority. Supported by national or international state subsidy, these players – including Électricité de France (EDF) – are committed to delivering electrification to Africa’s remote rural areas. Their intervention methods have developed significantly since the initial projects. Originally these programmes were organised around a village-based association that managed the new infrastructures independently. This organisational model has now been abandoned: during the years 1995–2000, all the players involved in rural electrification recognised that village-based management had demonstrated its limitations both in terms of economic development and in terms of the longer-term sustainability of the installations involved. Since the 2000s, therefore, there has been a general acceptance that a private operator (an “outsider” to the local community) can be responsible for operating the infrastructures. Gradually the principle of public-private partnerships has become established as the most appropriate solution to the challenges of this sector. 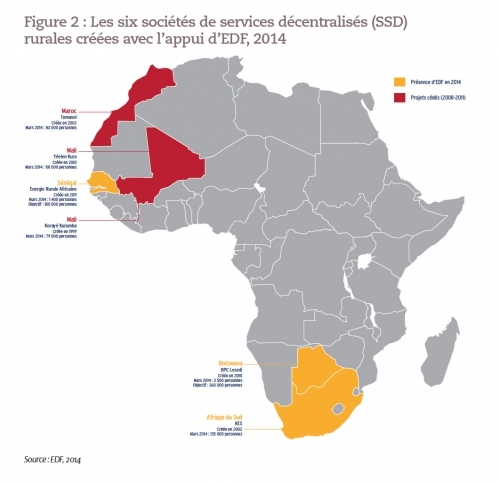 Drawing on their wealth of experience and pooling the insights they had gained as a result, EDF and ADEME (the French Environment and Energy Management Agency) therefore developed the concept of Decentralised Services Companies (DSCs). This initiative opened up the rural electrification sector to other players beyond the national operators, making it possible to take another step towards private-sector involvement in this particular activity sector. The DSCs, governed by local law and managed by local managers and personnel, are tasked with selling decentralised services (electricity, lighting, gas), generally to rural households, across a defined territory, for which they are awarded a concession lasting from 15 to 25 years (which is renewable). They are required to serve at least 10,000 customers, i.e. around 60,000 to 150,000 people depending on the size and structure of the family units within the regions concerned. To fulfil this mission the DSCs install, operate, maintain and renew electricity supply installations. EDF and its partners intervene in the start-up phase, contributing the capital and expertise needed to create the DSCs. For EDF, knowledge transfer and training the management team are a key priority. A representative of the French group is sent to the DSC location to start up the DSC and recruit the team who will take over its operation after EDF has withdrawn from the project. When the DSCs have utilised the capital provided to launch their operations, they need to balance their books, generate the profits they need for further growth and repay their shareholders. A DSC is therefore a commercial company in the traditional mould. Its only specific attribute is the existence of an initial capital contribution, reducing the impact of the investment on its costings and ultimately on the price customers have to pay. The model has nothing charitable about it: it is firmly rooted in the need to deliver profits, even at a low level, in order to guarantee the viability and durability of this kind of project. DSCs are genuine public-private partnerships, acting on behalf of the public authority within a clear regulatory framework (electrification concession, specifications, regulated tariffs, etc.) and thus requiring the prior existence of an appropriate institutional framework. EDF’s goal is to sell the DSC once it has proven its viability. Here, in contrast to the aim of the DSC, EDF’s primary objective is not to make money but merely to discharge its policy of social and environmental responsibility. The DSC is sold off at a pre-defined price reflecting the valuation of the business at the time of the disposal, the shares being ceded to the local partner who will ensure the company’s long-term survival. This is why it is so important for EDF to partner with a reliable local operator who will remain committed to the initiative. This partner can be a national electricity company, for example, or a private enterprise in the energy sector – as was the case in Botswana and Senegal respectively. This local partnership does not exclude the possibility of also involving partners operating on an international scale – as in Morocco, for example, or currently in South Africa with Total. Having benefited nearly 460,000 people,¹ one of the chief merits of the DSC model is to have revealed, via the various programmes implemented over a ten-year period (map 2), the key success factors common to all rural electrification programmes. Firstly, it is preferable to avoid any dogmatic judgements regarding the choice of energy sources: using renewables is not necessarily a universal solution. It is vital to provide appropriate customer management and payment methods (fixed-price packages, pre-payment, right of access, etc.). It is also necessary to establish competent, properly trained, sustainable organisational structures for operation and maintenance – always aiming at maximising economic performance and minimising costs, without sacrificing quality. And in all cases it is crucial that the rural electrification project is operating within a wider regulatory and institutional environment that is appropriate, simple, transparent, practicable and properly enforced. Financing plays a key role in the success of these projects: it needs to take into account both the low payment capability of the customers targeted and the need for the DSC to ensure its own viability and pay its shareholders. Technology choices always play a key role in determining the overall performance of the system. Yet none of these factors can eclipse the importance of the human element: human expertise is a key pre-requisite to ensuring that the entire system can function effectively over the long term. The specific characteristics of rural electrification (decentralised production techniques, economically fragile customer base, rural environment where education levels are low, etc.) call for specific competencies. Today, industry operators, project managers and funders recognise the need to organise more systematic professional training provision reflecting the new professions evolving in this sector. EDF and several partners² have proposed an initiative for “preliminary and advanced training for rural electrification operators and agents in West Africa”. This project, which was selected for funding by the European Commission in late 2010, aims to set up permanent training structures for rural electrification in two pilot countries, Burkina Faso and Mali, with the aim of replicating the project in additional countries at a later stage. The countries with the highest rates of electrification are those where the state has made this a priority, allocating significant resources to support its energy policy. Yet where financial and technical resources are absent, political decision-makers need to look to the private sector to implement and support electrification projects. And the role of the public authorities is to define a strategy and a framework for action, allocating specific responsibilities within public-private partnerships. These partnerships are most effective where the emphasis is on capacity building, serving a long-term vision by means of pragmatic, realistic strategies on the ground. As well as defining the overall strategy and allocating responsibilities to the public and private sectors, it is also governments’ role to establish sustainable foundations for these rural electrification projects, particularly via the training of local specialist personnel. Yet governments are not the only bodies that need to take action in this field. Funders and investors can encourage governments to include training promotion in their programmes; operators can forge partnerships with training institutions to create pathways connecting theoretical and practical training. NGOs, consultancies and equipment suppliers (often involved in ad-hoc training initiatives) need to be delivering their service offer within a wider system of collective provision, geared to the longer term. Providing capital funding is an important element, certainly – and yet the human element and dedicated expertise are key factors in the success of electrification projects and, beyond this, in all strategies for battling energy poverty. In any event, while the progressive liberalisation of the sector seems to be a matter of universal agreement, the model proposed by the DSCs, although currently very encouraging, still needs to prove its mettle over the longer term: the ultimate aim of any rural electrification programme is to make the market sufficiently attractive to interest private-sector investors. 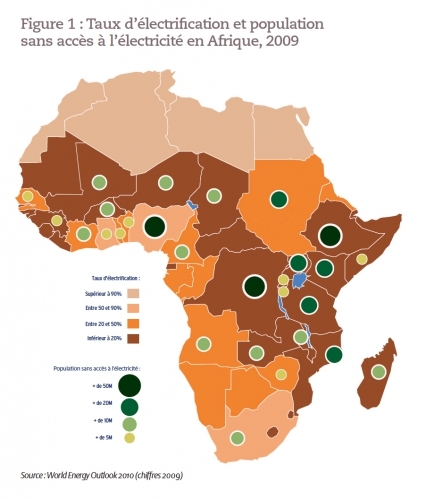 Senegal launched an ambitious programme of rural electrification in the early 2000s. With the support of numerous funders – including Agence Française de Développement (AFD) – an appropriate institutional framework was put in place. The authorities decided to grant rural electrification concessions to independent operators by launching international calls to tender. The EDF-CSI Matforce grouping was awarded the Kaffrine-Tambacounda-Kédougou concession and created the services company Énergie Rurale Africaine (ERA), 70% owned by EDF and 30% by CSI Matforce. This €12 million project (€7.7 million contributed by an AFD subsidy) offers three types of energy service. The electricity is produced either by photovoltaic kits or by decentralised generation plants connected to micro-grids – fulfilling the electricity needs of individual houses, offices, hotels, shops and administrations. The electricity can also come from the extension of an existing grid, purchased from the national electricity operator. ERA has three years from the receipt of the first tranche of subsidy (late 2013) to deliver electricity to the 18,000 anticipated customers. The concession has been granted for a period of 25 years. ERA is currently rolling out the active phase of the project; after four months of operation the company had around 150 customers. ¹ Total at mid-2013: the total number of customers of companies created by EDF and its partners, including those from which the group has now withdrawn, in the following countries: South Africa, Botswana, Mali, Morocco, Senegal. ² The partners are: AMADER, the rural electrification agency in Mali, the FDE, Fonds d’Electrification Rurale (rural electrification fund) in Burkina Faso and 2iE, an engineering training institute based in Ouagadougou.